Somewhere Else is a touching story about the absurdity of war and its horrors. How do the atrocities of war look like through children’s eyes? It is only through this perspective that we can fully understand the absurdity of war. This topic is quite delicate and painful, therefore it often remains concealed. It is however quite necessary to discuss it, and especially in front of the youngest audience. The performance includes a variety of modern technological approaches to puppet theatre. The classical puppet animation is intertwined with live video projections and virtual drawings. The actress and animatoress draws on a rotating table the environment, strolling around which we see the main heroine – the little girl. 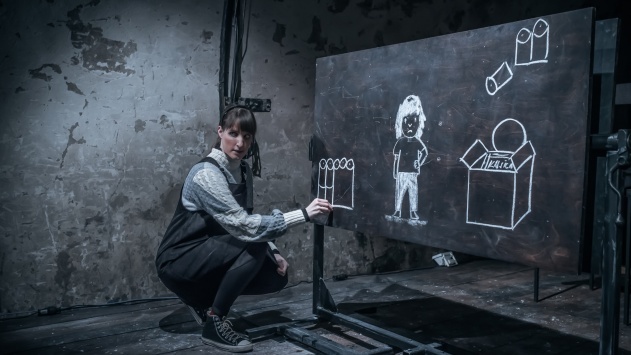 She uses chalk to draw hilly landscapes, high skyscrapers and shuddering soldiers. It is a simple bar drawing, magically coming to life during the performance. The drawn figures are moving around the surface of the rotating table and reacting to the environments, in which they find themselves. This effect results from the fact that the chalk drawing is actually complemented by the hidden projected image, which is moving according to the stop-motion animation principle. The combination of moving and non-moving drawings creates an illusion of an animated chalk drawing. The dynamic video mapping and tailor made sensors, which are depicting all the movements on the table live, blur the boundary between the real and projected image. It is an entirely new technique in the puppet theatre, overstepping and softening the boundaries between the individual genres. This visually animated adventure is interesting for theatre artists, animators and filmmakers alike, especially because they allow strong intertwinement of variety of genres. The video projections absorb the audience into the very heart of an exciting story about the atrocities of war, which are “fortunately” happening “somewhere else”. Or maybe not? Tin Grabnar has finished his studies in directing at the Academy of Theatre, Radio, Film and Television. He is expanding his field of interest in both classical and alternative theatre, as well as in dance and puppet theatre.